Ruth Pitman flies to Paraguay today to spend three weeks assisting Beryl Baker in her comprehensive but lonely medical ministry to needy people in the Chaco. Pray for Ruth’s adjustment and that she will bring great encouragement to Beryl. The latest Prayer Calendar for February is just in. In addition we have been asked specifically to pray for the election of a new Bishop of Paraguay and for new teachers in St. Andrew’s School. Paraguay has again been put on a Dengue Fever alert. There have been 150 suspected cases of the mosquito-born disease this year. 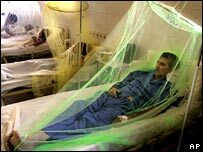 In 2007 an epidemic of Dengue caused 27,000 cases and 17 deaths. A number of SAMS Mission Partners caught the disease last year. Anyone who has had Dengue before is more at risk of the more dangerous form of dengue haemorrhagic fever or dengue shock syndrome. Please pray for our mission partners health at this time. The full story is on the BBC website. This month’s prayer calendar from the diocese of Paraguay, in pdf format. Bishop Andrés Rodríguez who, following Bishop John Ellison’s retirement, has oversight of the Diocese of Paraguay until the appointment of a new diocesan bishop. Bishop Andrés is extremely busy with all the extra responsibilities and this is the hottest part of the year. Pray for him and his wife Estela, and also for the procedures to appoint a successor to Bishop John. A vote could be taken at a diocesan synod in March. Mission Paraguay sends teams of volunteers out to work alongside the Anglican Church in practical projects, community based work, childrens’ activities and social projects. In 2007 41 volunteers, backed by many churches and organizations, spent June to August working in and around Asuncion, Concepción and the Chaco. Many worked on projects started by previous teams and this report will provide an update on the work. Paraguay gets under your skin. It is a subtle thing, something to do with the place (vast expanses of palm trees and swamps, and dusty cities) and it is something to do with the poverty that you see, in its varied forms, wherever you go. But mostly, I think, it is to do with the people. The people I met were warm hearted; they approached us as friends. They demonstrated their faithfulness and love for God by greeting us as family members. They challenged my understanding of reliance on prayer for every aspect of their lives. Let’s give thanks that the proposed degree course at FEISA, the Anglican Training College for Early Years Teachers in Paraguay, has been accepted and approved. Please pray for a good intake of students for its commencement next year, and for rest and refreshment for Head Estela de López and her staff during the summer recess.